Julienne Greer, associate professor of theatre arts, will discuss her research in social robotics for the Focus on Faculty lecture at noon-1:30 p.m. Wednesday, April 20, in the sixth floor parlor of the Central Library. A reception follows. "Empathy and Embodiment: The Interdisciplinary Collaboration of Theatre Arts and Social Robotics" looks at social robots that will be our companions, caretakers, and trusted friends in the future. The presentation shows how theatre arts methodologies of performance, emotion, and storytelling apply to the emerging field of social robotics and human-robot interaction. Dr. Greer is a 2015 recipient of a College of Liberal Arts faculty award granting the purchase of Pepper, an emotionally responsive robot. 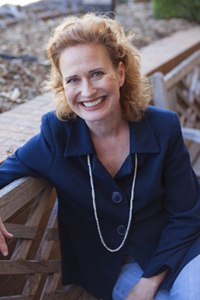 Greer has developed the curriculum for an interdisciplinary course at UTA titled "Humans and Robots." Focus on Faculty is sponsored by UTA Libraries. The Federal Bureau of Investigation advises that a telephone scam alleging that a relative or friend is a victim of kidnapping and a ransom will ensure their safety has been reported in Texas, California, Nevada, and New York. Criminals call people at random and claim to have kidnapped a family member when no actual kidnapping has occurred. The caller will likely go to great lengths to keep you on the phone, insisting you remain on the line, prevent you from contacting the “kidnapped” victim, and demand ransom money to be paid via wire transfer, not in person; ransom demands may drop quickly. The UTA Police Department asks that if you receive such a call, contact the office immediately at 817-272-3003 to make a report and for additional assistance. Read the FBI’s action tips and virtual kidnapping overview. The Federal Trade Commission provides background information with options for filing a complaint related to the incident. FBI also has advice about a telephone scam about a relative in financial or legal crisis and an email scam about being a hit man’s target. Campus elections are today, Tuesday, April 19. Bring your student ID to vote 9 a.m.-6 p.m. in the University Center Gallery in the E.H. Hereford University Center. Available positions include Student Congress president, vice president, and senators; Mr. and Ms. UTA; UTA Ambassadors; and Student Service Allocation Committee representatives. 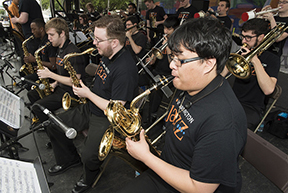 UTA's various jazz musical groups performed Saturday at the Main St. Fort Worth Arts Festival. The annual Jazz Brunch allowed alumni to enjoy a meal, music, and fellowship. See more photos. 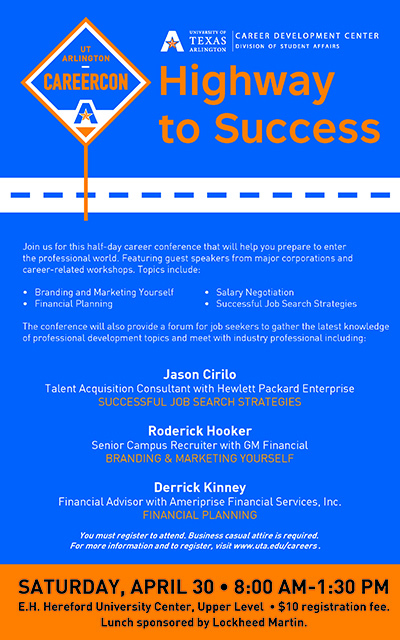 University College will host its job fair 4-6 p.m. Tuesday, April 19, in the lobby of Ransom Hall. Hiring departments will be on hand with job descriptions, and SNAP Job representatives will be present to assist students with questions and job searches. University Tutorial and Supplemental Instruction (UTSI) is looking for motivated students to become tutors and SI leaders for the fall semester. Tutors and SI leaders are personable students who earn As and Bs in their courses and want to share their knowledge with their fellow Mavericks. For details, visit uta.edu/tutoringjobs. The Department of Finance at the College of Business will host a series of financial literacy workshops and free credit counseling during Money Smart Week, Monday-Thursday, April 25-28. Receive personal financial advice and credit consultations from financial services professionals 9 a.m.-3 p.m. at different locations on campus. Professional loan officers will be available to offer personal credit report evaluations and recommendations for improvement. Attendees will obtain a free copy of their credit report and consultation. Read more about the Money Smart Week workshop schedule. The UTA Ambassadors are looking for a creative student to repaint one of the fiberglass spirit horses. The deadline to submit a proposal is Friday, April 29. If your design is chosen, you will receive painting supplies and a $500 stipend for the project, which must be completed by July. The horse will then be displayed in a prominent location on campus. Visit the UTA Ambassadors website for details. Contact Jennifer Fox at jdfox@uta.edu with questions. Tryouts for the fall 2016 UTA color guard are 10 a.m.-4 p.m. Sunday, April 24, in the Maverick Activities Center. The color guard practices, travels, and performs with the Maverick Marching Band. Tryouts will consist of dance and equipment choreography that will be taught that day as well as a short routine of each performer's choice. Attire is all-black dance or athletic wear. Information on rehearsals, class times, and required courses will be available at the tryout. For an audition spot or questions, email color guard director Karen Blake at karen.blake@uta.edu. Earth Day T-shirts: There's still time to buy an Earth Day T-shirt in the Sustainability Office in Room 204 of Preston Hall. Sizes small, medium, and large are available and some children's sizes. A bike share program would allow students, faculty, and staff to check out a bicycle from one or more locations and return the bike at a later date. This will reduce congestion in parking lots, improve public health, reduce emissions, and create a cleaner, healthier, and environmentally sustainable campus. Look for instructions on claiming tickets in your UTA email accounts. 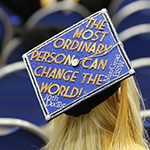 Visit the Commencement website for details on ticket quantities and availability. MavPlays: 'Helios 24/7' Helios 24/7 by playwright-in-residence Natalie Gaupp follows a businesswoman and her artist daughter at odds in a world where the need for sleep can be permanently expunged. Tickets $7 faculty, staff, students, and seniors; $10 general public. 8 p.m., Studio 137, Fine Arts Building. Also, 8 p.m. Saturday, April 23. Theatre Arts. MavPlays: 'Dogwood' Dogwood by playwright-in-residence Seraphina Nova explores three people still nursing the scars of childhood whose aging parents were not aware of the damage they caused. Tickets $7 faculty, staff, students, seniors; $10 general public. 8 p.m., MainStage Theatre, Fine Arts Building. Also, 2:30 p.m. Sunday, April 24. Theatre Arts. Softball Mavericks vs. Troy. Tickets $5-7, $3 students. 1 and 3 p.m., Allan Saxe Field. Athletics. The Day of the Child The multicultural celebration of children, families, and reading includes storytelling in several languages, entertainment, crafts, games, and prizes. 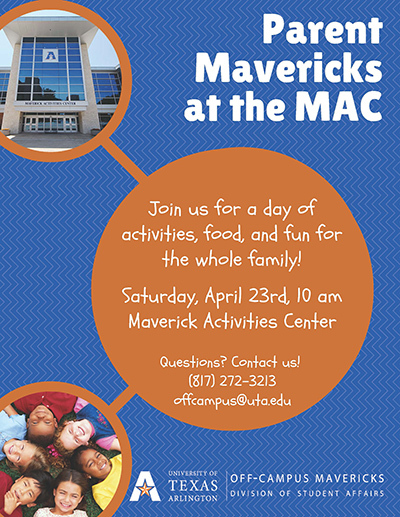 2-5 p.m., Maverick Activities Center. Modern Languages. Faculty Creative Works Exhibit Artwork by faculty of the Art and Art History Department and posters, playbills, and a model set design by Theatre Arts faculty from their 2015 productions. Sixth floor, Central Library. Through Monday, April 25. UTA Libraries. Political Science Week Panel Discussion Political science faculty March Cichock, Brent Sasley, and Dale Story discuss "America and the World: Love It or Leave It." 12:30 p.m., Room 108, University Hall. Political Science. Political Science Week Panel Discussion Political Science Department experts Brent Boyea, Rebecca Deen, Thomas Marshall, and Allan Saxe discuss this year's presidential candidates and the election process. Noon, Room 115, University Hall. Political Science. Political Science Week Panel Discussion Political science faculty Daniel Sledge and Trey Thomas discuss "Understanding Emerging Threats." 12:30 p.m., Room 108, University Hall. Political Science. Studying for Tests Battle test anxiety and plan ahead for exams. Snacks provided. Noon-1 p.m., Room 104, Preston Hall, Also, Thursday, April 28. University College. Texas American College of Sports Medicine Lecture Hirofumi Tanaka, director of the Cardiovascular Aging Research Laboratory at UT Austin, “Masters Athletes: Super Humans with Gray Hair and Wrinkled Skin?” Noon, Lone Star Auditorium, Maverick Activities Center. Kinesiology. Social Work Colloquium Joanne Sobeck of Wayne State University, “Building Research Capacity.” RSVP to michael.olayiwole@mavs.uta.edu. 1-2 p.m., Room B107, Social Work Complex B. Research and Professional Development, Social Work. Frontiers in Science Edward F. DeLong of the University of Hawaii at Manoa, “Towards 4-Dimensional (Eco) Systems Biology in the Sea.” 1 p.m., Carlisle Suite, E.H. Hereford University Center. Biology. Psychology Colloquium Stephan Motowidlo of Rice University, “Knowledge about the Utility of Prosocial Professionalism.” Noon, Room 110, University Hall. Psychology. Homebody: Junior catcher Kacey Everett makes it home in one of three games against Louisiana-Monroe this past weekend at Allan Saxe Field. The Maverick baseball team lost a doubleheader to Georgia Southern last weekend at Clay Gould Ballpark. The Mavs are 20-17 overall and 6-9 in Sun Belt Conference play. The team plays Dallas Baptist at 2 p.m. Wednesday, April 20, at Clay Gould Ballpark, and Troy Friday-Sunday, April 22-24, in Alabama. Softball earned three wins over Louisiana-Monroe on Friday and Saturday at Allan Saxe Field. UTA is 27-12 overall and 6-9 in league play. 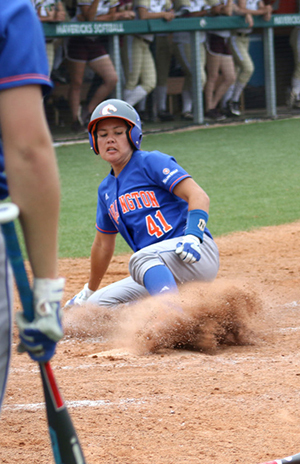 Coach Kristie Fox achieved her 100th career win in her four-year tenure at UTA. The team plays Lamar today, Tuesday, April 19, in Beaumont and Georgia State Saturday-Sunday, April 23-24, in Atlanta. Maverick men's tennis finished the regular season with a 15-10 record after a 4-0 win over Midwestern State on Saturday at the UTA Tennis Center. The team heads to the Sun Belt Championship tournament with the first round on Thursday, April 21, in New Orleans. UTA’s women's tennis was one of 14 Sun Belt Conference programs recognized for outstanding academic performance by the NCAA. The Mavs also were recognized in 2014 and 2015 for having the highest GPA for women's tennis in the conference. The team is 16-4 overall and 4-0 in SBC play and will compete this week in the SBC Championship tournament in New Orleans. The men’s golf team plays in the Sun Belt Conference Tournament in Destin, Fla., Sunday-Tuesday, April 24-26. Tickets are available for the 2016 UTA All-Sports Banquet at 6 p.m. Wednesday, May 4, at College Park Center. Emily Jones, the Texas Rangers field reporter and host of Rangers Insider, is the keynote speaker. Tickets are $25. Table sponsorships are available for $250 and $500. 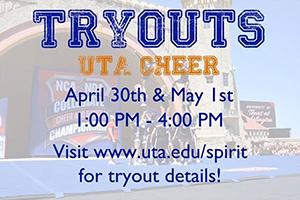 For details, contact Danielle Sanders at 817-272-0694 or danielle.sanders@uta.edu.